NATCHITOCHES — Eddie Kennison rounded a bend of the Louisiana Sports Hall of Fame and Northwest Louisiana History Museum, which mimics the meandering Cane River Lake, catching the eye of fellow Hall of Fame inductee Juan Pierre. Pierre, an Alexandria native, is 18th in career stolen bases in Major League Baseball history. Kennison, a Lake Charles native who was an All-American sprinter at LSU before a 13-year NFL career as a receiver, smiled and said “baseball fast” and “football fast” are two different things. He admitted that he’d pull every muscle in his body if he raced Pierre now. Pierre and Kennison will be joining Shreveport PGA pro David Toms, jockey Calvin Borel, Southeastern hoopster C.A. Core, former Nicholls State baseball coach Ray Didier, NFL standout Ed Reed, Dave Dixon Sports Leadership Award honoree Sue Donohoe and Distinguished Service Award winners Jim Henderson and Dan McDonald at this weekend’s festivities in Natchitoches. 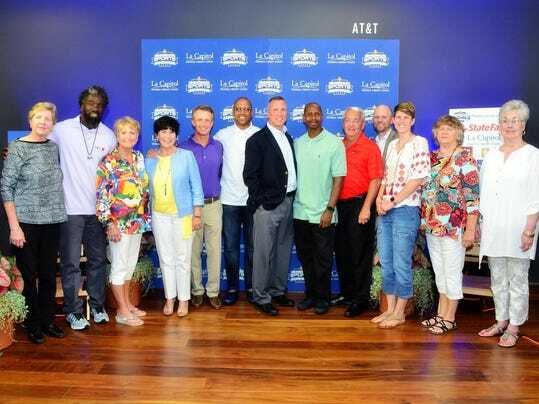 The prestigious group will officially be inducted Saturday at 6 p.m. Saturday in the Natchitoches Events Center, spoke about how they were fans of each other throughout their careers. Hard-hitting Baltimore Ravens safety Ed Reed, now an avid golfer, wanted lessons from David Toms, who won 13 PGA Tour events. Toms, an LSU alum who cheers for the Tigers in every sport, mentioned the connection he felt to fellow LSU inductees Kennison, legendary gymnastics architect D-D Breaux and football/baseball skipper Ray Didier. “People ask me all the time why I choose to live in Louisiana,” said Toms, who was born in Monroe and went to Bossier City’s Airline High School. “The best answer is the people in this room. Toms recalled that LSU enthusiasm when he won a PGA Tour event in New Orleans in 2001 with chants of “Way to go Tiger” -- referencing his LSU Tiger status and not that of Tiger Woods, which he had to explain to partner Ernie Els. Toms outlasted Phil Mickleson in the Compaq Classic in May, which gave him the confidence to edge Mickelson in the PGA Championship three months later. Before Juan Pierre joined the Florida Marlins and led that squad to the 2003 World Series (World Series MVP), he was keeping up with then-University of Miami safety Ed Reed. The inductees spoke of Louisiana pride and continuing the state’s athletic excellence. “You play all over the United States, but you always have a part of Louisiana in you, and I know everybody else feels the same way,” Pierre said. “I didn’t know much about the Louisiana Sports Hall of Fame, but when they told me who I was going in with, I didn’t know if I belonged. Reed said he was a huge LSU baseball and coach Skip Bertman fan, but the Miami palm trees and wanting to extend Louisiana’s brand of athletics to other parts of the country lured him to the Sunshine State. “Every time I was on the field, I wanted to represent Louisiana,” said Reed, a St. Rose native who made nine Pro Bowls and led the Ravens to the 2013 Super Bowl. “When I was coming up, I didn’t feel like people respected Louisiana athletes and we weren’t highly recruited. Breaux listed Bertman as a mentor as she built a prominent LSU gymnastics program that turned the corner to make six Super Six appearances with two national runner-up championships in the last 12 years. Just as important, Breaux built support on LSU’s campus as thousands flood the Pete Maravich Assembly Center for home meets. Sue Donohoe knows a thing or two about relevance. The Pineville native made her national television debut in 1982 as a barefoot Louisiana Tech graduate assistant running to the scorer’s table every minute to report the time remaining to coach Leon Barmore during the first women’s basketball NCAA championship to directing both the NCAA men’s and women’s basketball championships until 2010. “The clock stopped working, and (Baremore) wanted to know how much time was left every 20 or 25 seconds,” said Donohoe, who is receiving the Dave Dixon Louisiana Sports Leadership Award. “I had high heels on, and my feet were killing me. Donohoe said the first women’s championship event drew a total of 7,000 for the whole weekend. Donohoe said the 2002 crowd swelled to 29,619 fans in San Antonio, Texas. Most inductees spoke of how they carried Louisiana with them to various playing fields. Daughter Chelsea Core described how she carried her father, deceased Southeastern Louisiana basketball great C.A. Core, with her. “My mom told me that I held myself like my father and played like my father,” Chelsea said about her father, who still holds SLU records for career scoring and rebounding. “Every time I was out there playing, he was on the court with me, for sure. Coach Ray Didier led three different programs at then-Southwestern Louisiana Institute (now Louisiana-Lafayette), LSU and Nicholls State, guiding the Colonels baseball team to the NCAA Division II championship finals in 1970. Former player Mike Harris said it won’t be the conference titles or wins for which Didier will be remembered. “Coach Didier taught us discipline and how to be men,” said Harris, a member of Nicholls’ 1970 team. “He taught us how to win as a team and to get our degrees -- he made sure we all graduated. Three-time Kentucky Derby-winning jockey Calvin Borel will join Breaux, Core, Didier, Kennison, Pierre, Reed and Toms as 2017 inductees. Longtime sports information director Dan McDonald and legendary radio broadcaster Jim Henderson each received the Distinguished Service Award. McDonald said he never felt like he worked a day in his life, but he felt weird not doing any work Thursday. So he playfully recruited Toms to play in Lafayette’s Web.com Tour stop. “I can probably pull a few strings and get you a sponsor exemption when you want to come down and play,” McDonald joked. Click here for 2017 HOF Inductees Photo Gallery.